Jezebel Productions was founded in 1984 by Greta Schiller and Andrea Weiss. Its aim is to produce educational films about real people whose lives can inspire viewers to laugh, think and learn. The company has been based in New York City and London since 1998. The films have garnered two Emmies, dozens of film festival awards around the world and have been broadcast in over 25 countries. 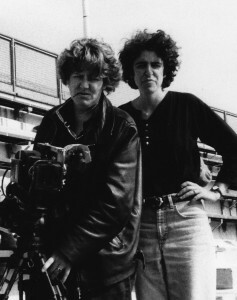 Jezebel Productions grew out of Andrea Weiss’ and Greta Schiller’s collaboration on the groundbreaking documentary, Before Stonewall, directed by Schiller in 1984. The film was the first gay or lesbian film to be funded by the Corporation for Public Broadcasting. When the film was broadcast nationally over PBS, the response ranged from disgust and outrage that public television would show such a film to people writing in that the film was a lifeline. Schiller and Weiss won Emmy Awards, Independent Spirit Awards, and dozens of domestic and international awards. The film launched their careers in the international independent film scene. 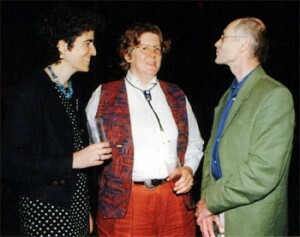 (from left to right): Andrea Weiss, Greta Schiller, and Alain Marchand, director of the Cinematheque Francaise, at the Jerusalem Film Festival in 1996. From the very beginning, Schiller and Weiss were true independents, making films that reflected their political and artistic ideals. Strongly influenced by the New Left and the women’s and gay liberation movements of the 1970s, they set out to make documentary films that uncover, reconstruct, and celebrate the lives of ordinary people doing extraordinary things; often these were people whose lives were overlooked and systematically erased from cultural memory. Twenty years later, despite chronic funding obstacles and a stubborn attraction to marginal subjects, they are still doing just that, using a variety of styles to tell their stories. Schiller and Weiss went on to create International Sweethearts of Rhythm, which premiered in the New York Film Festival in 1986. How could it be that this all-female, multi-racial big band was headlining the Apollo Theatre in the 1940s, playing to sold-out mobs, and yet were not even mentioned in the jazz history books? International Sweethearts of Rhythm was followed shortly by Tiny & Ruby: Hell Divin’ Women, a film that spotlights one outrageously funny trumpeter from the Sweethearts band, billed as “The Female Louis Armstrong”, and her life-long partner on and off the bandstand. The critical and popular success of these two short documentaries moved Jezebel Productions into high gear, and over the next few years there was a flurry of international co-production, aided in part by Schiller being awarded the first ever US-UK Fulbright Arts Fellowship in Film. Her Maxine Sullivan: Love to Be in Love, a portrait of the long forgotten jazz star, received positive reviews and prime-time broadcasts in France and Britain. Schiller made a foray into fiction, and directed the quirky short Woman of the Wolf, based on a 1905 short story by poet Renee Vivien. Funded by ITVS, this strange fantasy film set on a cargo ship was well received on the festival circuit before it was broadcast over PBS and Britain’s Channel Four (the broadcast was chosen as a “Critic’s Choice” by the Sunday Times of London). But the huge labor of love that Jezebel Productions embarked on, taking five years to produce and, when finally finished, achieving the impossible for a documentary – it broke house records upon its theatrical release – was Paris Was a Woman. Because of their great love for the city of Paris, for the era of the Twenties, and for the women that flocked there at that time, Schiller and Weiss were determined to produce this film despite all odds. The film received virtually unanimous praise from the critics upon its release, but it was the overwhelming audience response that was most gratifying to the filmmakers. Tickets were scalped at the Berlin Film Festival premiere as though it were a rock concert; long lines ran around city blocks when it opened in the Seattle Film Festival. And by sheer good luck, the programmer for the Quad Cinema in New York City was standing in that line, which led to a very successful New York theatrical release. After the huge challenges of producing Paris Was a Woman, Schiller and Weiss felt the need to challenge themselves further as filmmakers and experiment more directly with the documentary form. Schiller’s The Man Who Drove With Mandela, a portrait of Cecil Williams, white theatre director who was both an ANC activist in apartheid South Africa and a flamboyant gay man in the sexually repressive Fifties, combined historical documentary with a theatrically staged one-man show (starring Corin Redgrave). The crazy grafting of these two styles turned out to be a risk worth taking: the film won an award for Best Documentary at the Berlin Film Festival – the first South African film ever to win an international award — and was a runaway theatrical hit in South Africa. Although few there had ever heard of Cecil Williams before, overnight he became a posthumous hero. At the same time Weiss directed Seed of Sarah, a half hour experimental documentary telling the story of a Hungarian girl, Judith Magyar, growing up during World War II. Historical documentary footage combines with an avant garde opera drawn from her memoirs; the sumptuous voice of internationally acclaimed vocalist Angelina Réaux is interwoven with Judith Magyar’s spoken thoughts as she looks back on memories she had long repressed. A co-production with the Banff Centre for the Arts, the film premiered in the Marseilles Documentary Film Festival and was broadcast in several European countries. Schiller and Weiss went on to combine fiction and documentary genres in their feature film,Escape to Life: The Erika and Klaus Mann Story, which features the voices of Vanessa and Corin Redgrave as the siblings Erika and Klaus Mann. Produced by Schiller, and written and directed by Weiss (together with fiction director Wieland Speck), Escape to Life was a festival and theatrical success across Europe and has been broadcast in Germany numerous times. It had a sold-out audience at its premiere at the Museum of Modern Art in New York City, was chosen for California’s Laemmle Theatres’ Doc Days series, and toured in the Southern Circuit independent film series across the American South. Weiss subsequently wrote a full-length literary biography about these two enfants terrible: “In the Shadow of the Magic Mountain: The Erika and Klaus Mann Story,” published in 2008 by the University of Chicago Press. More recently Schiller and Weiss have worked in digital production, making films about contemporary subjects, although they still have a keen interest in history. Jezebel Productions’ newest releases include I Live at Ground Zero, broadcast over European television, about the aftermath of the tragedy through the eyes of a nine year old girl who experienced it first-hand, and Recall Florida, a road movie following Janet Reno’s 2002 campaign for Governor of Florida, another stolen election story in Florida that was not reported as such on the news. Their film, U.N. Fever, follows three teams of college students as they compete in an international Model U.N. competition; it’s a character-led story leaving audiences feeling hopeful about the next generation and its commitment to world peace, human rights and justice. After twenty five years and more than a dozen films, Jezebel Productions remains steadfast in its determination to tell the stories of ordinary, exceptional people, who can inspire us and make us think about our own purpose on earth. Schiller and Weiss have developed considerably as filmmakers along the way, but they never stopped putting their work and their lives where their hearts are. The body of work they created over the decades continues to be innovative, thought-provoking and yet entertaining. The pleasures of these films remain undiminished by time and their messages remain as vital today as ever.